OFM has just taken guest seating to the next level. Always ahead of the curve, this innovative brand is turning heads yet again with the unbelievable new Morph soft seating collection. In today's post we'll take a look a this powered furniture line and it's unique attributes that set it apart from all other seating available in 2015. Need to create private spaces on a whim? OFM provides the ultimate in seating options with the MORPH collection. MORPH seating provides a comfortable, supportive sitting experience that features an easy flip panel designed to create instant privacy. 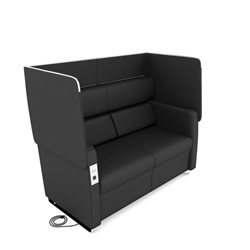 These high tech lounge chairs and reception sofas feature easily accessed electrical recharge panels with AC outlets and USB ports. Choose from three attractive color options to meet your specific decor needs. Accommodating big and tall guests in your lobby, lounge, and waiting room? No problem! MORPH sofas support users up to 500 pounds. Even at first glance the 2201 Morph chair will wow you. You'll be instantly impressed at the contemporary lines and thick padded cushions. 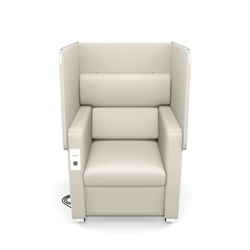 Take a seat in the Morph chair and you'll be greeted with high tech features designed to instantly improve your waiting experience. Running low on cell phone power? No need to worry. Simply plug your device into the Morph power panel and you're charged up in no time. OFM introduced the all new MORPH soft seating collection with comfy sofas to match the chairs. This makes creating cohesive waiting environments a breeze! Morph sofas offer the same great power features and sit up to 3 guests comfortably. The exterior panel of the 2202 Morph sofa can be easily raised for privacy when needed, and lowered when not. 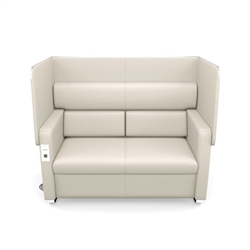 These high end sofas work great in professional reception, lounge, and waiting room areas. Overall Height: 40.50" - 50.75"
The new MORPH seating collection from OFM is an absolute winner. These chairs are so ahead of the curve that there's really not much on the market to compare them too. We'd like to see the sofa outfitted with electrical outlets on both arms, but that's really our only critique! The MORPH chair is now available for $769.07 and the sofa is priced a bit higher at $1153.69. Do a little shopping and you'll find that these new seating solutions from OFM provide a lot of bang for the buck! Many lounge chairs without privacy panels and electrical options are priced twice as much. MORPH seating ships super quick to help you meet your makeover deadlines. Shoppers will love the Linen, Midnight, and Graphite color options that are available on both the chair and sofas from this hot new collection. Overall, we give the MORPH collection 4.5 out of 5 stars. This new seating collection is truly raising the bar!